Examples from the past - Concentric Development Inc.
Community owned and operated schools in northern Pakistan. As General Manager for the Aga Khan Education Service (AKES) in Pakistan’s northern mountains, Jonathan was given responsibility for 180 remote rural girl’s schools that required a high level of outside subsidy, delivered low quality of education to communities that desperately wanted their schools upgraded to middle or high school level. He had the seemingly impossible task of reducing the level of subsidy, increasing quality and providing affordable access to higher levels of education. Together with his staff and community representatives, and sometimes in desperation, they discovered how to forge a partnership with individual communities that gave them responsibility for day to day school management and empowered them to reach out to their diaspora and relationship network to leverage donations, government resources and a stream of qualified teachers keen to serve their community that AKES could never have achieved. AKES took responsibility for selecting teachers from community-identified candidates, providing oversight of educational quality and affiliating schools with the national examination board. The rote memorization emphasis of Pakistan’s high school matriculation examinations undermines efforts to improve subject understanding and problem solving among students. 3 years of effort to improve high school learning in northern Pakistan taught us that teachers who had their students do little more than memorize past exams for the last two years of high school got the best examination results, and efforts to improve understanding caused examination results to fall. The examination was the primary obstacle to quality improvement, but the national and provincial examination boards had no intention of changing. In 1998, in his capacity as General Manager of the Aga Khan Education Service, Jonathan requested the Aga Khan University to examine the feasibility of establishing an independent examination board under the terms of their federal charter, pointing out that they could build on their experience with their admission exam. 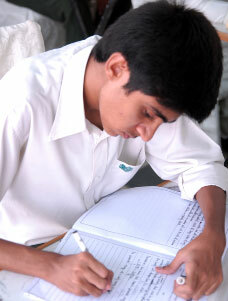 By 2002 Pakistan’s National Assembly had officially authorized the establishment of the Aga Khan University Examination Board (http://www.aku.edu/akueb/), and in 2003 in his capacity as Senior Education Advisor to USAID Pakistan, Jonathan was instrumental in securing $4.5 million in USAID funding for its launch. Pakistan now has a private independent examination board, the AKUEB, combined with support services to help schools and teachers make the transition to instruction intended to foster subject understanding and application. It takes an understanding of the political economy to identify successful strategies for change. This is true in mission organizations as well as local and national churches. The government examination boards themselves have begun changing the format of their examination for fear of being sidelined by the AKUEB.